RHEA Page, 22, was beaten up by an all-girl gang of three sisters and their cousin in Leicester city centre. As the women kicked and punched Page they allegedly yelled “Kill the white slag”. The four girls had screamed ‘kill the white slag’ as they kicked her. The four Somalian girls are Muslim. 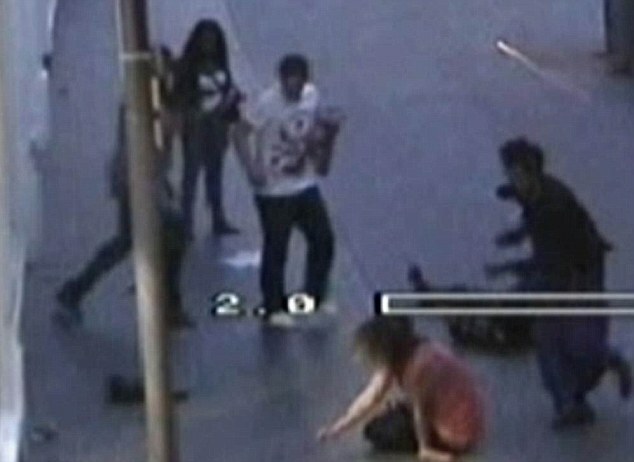 Page was with her boyfriend, Lewis Moore, 23, waiting for a taxi when she was attacked by Ambaro Maxamed, 24, Ayan Maxamed, 28, Hibo Maxamed, 24, and Ifrah Nur, 28. In court, each of the women admitted actual bodily harm. The criminals were not jailed. They were handed suspended sentences, each sentenced to six-month jail terms, suspended for 12 months, at Leicester Crown Court last month. Hibo Maxamed also received a four-month curfew between 9pm and 6am, while the others were ordered to carry out 150 hours of unpaid work. Judge Robert Brown gave them suspended jail terms after hearing mitigation that as Muslims, the women were not used to being drunk. The Koran prohibits Muslims from consuming alcohol, although Islamic teachings permit its use for medicinal purposes. None of the defendants was charged with racial aggravation. The court did not believe race to be a factor. Nur claimed Mr Moore, a fence builder, had been racially abusive, but this was not accepted by the prosecution. Are they a gang because they are Muslims? No. Did the judge pay any heed to the defence’s argument about religion affecting their tolerance to booze? There is no sign that he did. Rhea Page, 22, had been walking home with her boyfriend after a night out when the drunken women attacked her, knocking her to the ground and taking turns to kick her in the head. The Telegraph story does not mention the word “Muslim” once. But the judge handed the girls suspended sentences after hearing that they were not used to alcohol because their religion does not allow it. We do not know that the judge paid any heed to defence’s argument. But the Sun makes a direct link. This smacks of dishonest reporting. The judge let Ms. Page’s assailants off with suspended sentences. He said that they were not used to the effects of alcohol, due to their religious and cultural background.No. He did not. Only, race was not a proven issue in the crime. Muslim women not used to drinking walk free after attack on woman… However, the judge handed the women suspended sentences after hearing that they were not used to alcohol because their religion does not allow it. Our intention is not to play down Miss Page’s suffering, rather to ask why this story made it to page 5 of the Daily Mail and is worthy of a Sun editorial that says the girl gang “screamed racist abuse… The poor dears were Muslims and not used to drinking, you see“. This was not about Broken Britain, the Sun’s pet cause. Why not? Why isn’t this presented as just another grim case of mindless, drink-fueled violence? Why is this about Muslims attacking a white woman?